Non-hairy brush pens with waterproof ink. In January I reviewed seven brush pens with non-hairy tips (defined by me as tips made of a compressed material that can’t be separated into individual hairs). In that review, I wrote at length about how I like to use these non-hairy brush pens, so I won’t repeat myself here. This follow-up addresses two characteristics – waterproof ink and refillability – that weren’t well-represented in that group. Although many different types of non-hairy brush pens are available, almost all contain water-soluble inks, which I often prefer. Once in a while, though, I want a waterproof brush pen to use with watercolors, and the only non-hairy ones I’d found were the Faber-Castell Pitt and the Deleter Neopiko Line 3, both of which have relatively small tips (smaller than I like). My bigger complaint with all of the non-hairy brush pens I reviewed was that none was refillable. 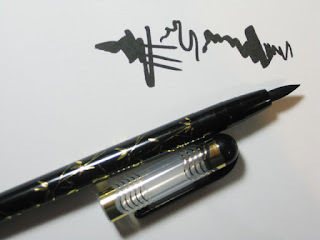 Since easily refillable hairy brush pens in a fountain-pen-like form factor are readily available (I included four in my hairy review), it seemed to me that a non-hairy counterpart should be available somewhere. 1. 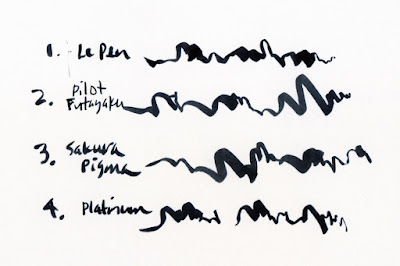 The Marvy LePen Technical Drawing brush pen (a gift – thanks, Michele!) has a slightly soft tip that I like, but its tip is also smaller than I prefer, comparing closely to the Faber-Castell Pitt and the Deleter Neopiko Line 3 mentioned earlier. 2. 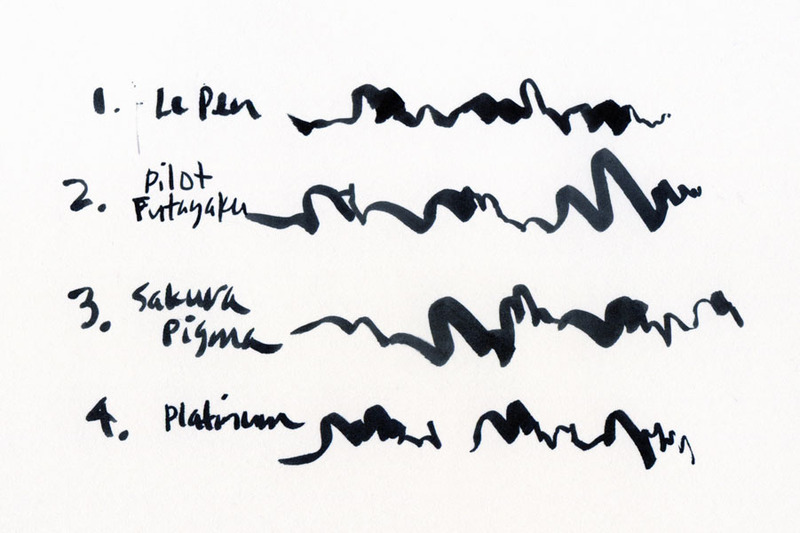 The Pilot Futayaku double-sided brush pen has the benefit of two sizes of tips in one. The larger end is about the same size as the Marvy LePen, but it’s firmer. The smaller end is small enough that it can be used to write with easily. 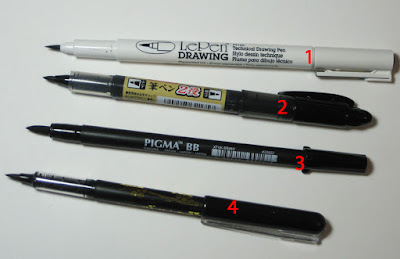 The three pens above are all also available in non-brush tips similar to other technical pens. Black ink and painted afterwards. 4. The best find came as a gift from a blog reader and fellow Seattle Pen Club member (thanks, Alex!). Noting my complaint that none of the non-hairy pens I knew about were refillable, he handed me a Platinum Japanese Art Pocket Brush Pen. Although the tip isn’t as large as I’d like (it’s comparable to the Marvy LePen and Pilot Futayaku), it’s a bit spongier than the others, and best of all, it has the fountain pen form factor I love. It takes standard Platinum fountain pen cartridges (as well as a Platinum converter), so I can fill it with my favorite bottled waterproof ink, Platinum Carbon Black (it came with one cartridge of it). Eureka! Purchased at the Japanese dollar (or rather, dollar-and-a-half) store Daiso downtown, it doesn’t seem to be available at Daiso’s online store. Seattle is lucky enough to have several branches of these sometimes-strange, often-amusing chain stores. A new one opened right before the holidays in the Roosevelt Square neighborhood only a mile or so from home, so I don’t have to go all the way downtown or to the International District to shop there anymore. Right after the Pen Club meeting, I stopped off at that Daiso to look for the Platinum pen, but alas, my Roosevelt store didn’t have it. However, I discovered that JetPens carries it, too (unfortunately, for more than double the price of Daiso, where almost everything goes for $1.50). I’ve been testing the Platinum Art Pocket Brush Pen lately, and its tip is nearly as responsive and spongy as any other non-hairy brush pen I’ve tried. But at $1.50 and refillable, it’s clearly the biggest bang for the buck-fifty. 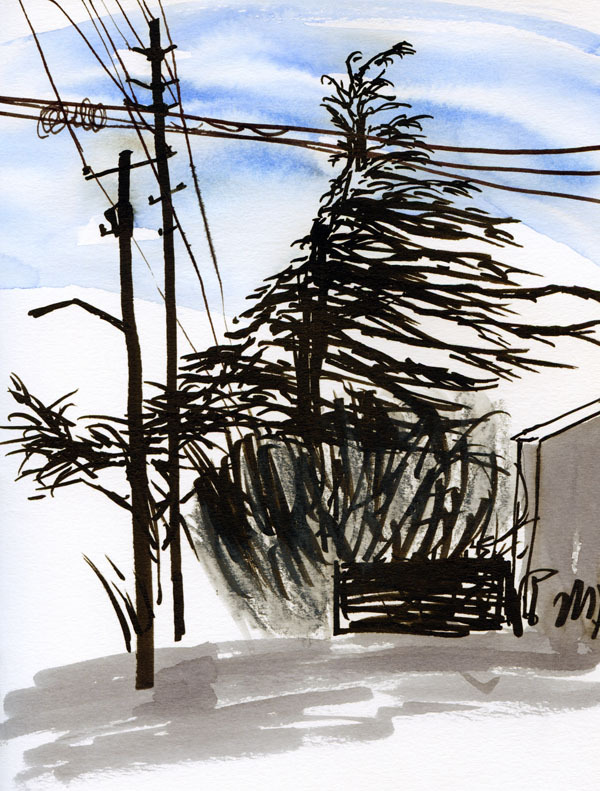 Edited 3/12/16: Finding myself near the International District Daiso store yesterday, I went in to look for the Platinum Art Pocket Brush Pen. 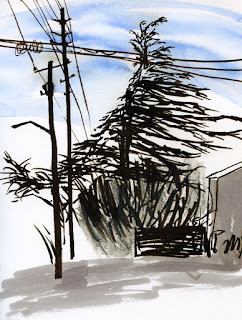 This branch didn’t stock it either, but instead I found a different Platinum non-hairy brush pen. Unfortunately, it’s not refillable, but the ink is completely waterproof, and the large brush tip is the kind I prefer. Neither the packaging nor the pen says in English that it is made by Platinum (I had to do a little Japanese deciphering), but it can be identified by the gold bamboo leaves on the pen body. At $1.50, it’s less than half the price of the Pigma BB (the only other waterproof non-hairy brush pen I found with a large brush tip), so you can’t beat the value. If only it were refillable. I'll have to come back to this post when I get home from my trip and take note of what you found that is waterproof...wait, I can put it in my notes on my computer! Thanks for the info. I'm going to have to look for these here in Portland. Thanks for the review!